PORT HARCOURT (MOTHERBOARD)--Okachi Chukuigwe runs a small confectionery in Port Harcourt—the capital and largest city of Rivers State, Nigeria. Since she returned from Benue in November, she has had to take extra precaution in making the food she sells. Because there’s a layer of soot on every surface in the city, she has to wash her oven thoroughly and find creative ways to cover her baked goods as they cool. Chukuigwe is one of an estimated two million residents of Port Harcourt. The city’s claim to fame is petroleum. It is the chief oil-refining city in Nigeria and has two main oil refineries and a few illegal refineries that process around 210,000 barrels of crude oil a day. However, in November of 2016, Port Harcourt residents woke up to find their city covered by a thick fog. But this thick fog is just one of the many environmental problems Port Harcourt has had over the years: The area has been plagued with oil spills, acid rain, and gas flares. Over the years, the people of Port Harcourt, from the late Ken Saro Wiwa to residents, have protested and demanded action on issues like oil spillage and gas flares. The incomplete combustion of hydrocarbons from the refineries—legal and illegal—is a major source of the soot in the state. There has been no regulation specifically against flaring and the combustion devices used in refineries despite numerous studies done to show its impact on the environment and the amount of money lost in the process. Leaving this unchecked is fatal—worldwide, air pollution is the cause of 6.5 million premature deaths a year, according to the World Health Organization. 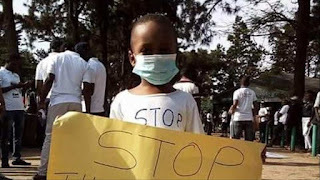 In February of 2017, the Federal Ministry of Environment declared the air pollution in Port Harcourt an Emergency Situation, ordering the temporary shutdown of an asphalt processing plant in the city after a protest there. A task force headed by the Rivers State Commissioner for Environment was also created to investigate and report on the cause of the soot, but to date, no report has been filed by the environmental commissioner. Despite the temporary shut down of the asphalt factory, the situation remained the same. Residents are hoping the government will take charge and shut down illegal refineries, while setting new standards for how the remaining refineries will run to reduce the soot. But different arms of the government keep evading responsibility. In April, the state government said it couldn’t cut down a petrochemical plant because it’s within federal jurisdiction. A second protest with a little over 350 people was organised on April 19, this time to demand that the state government sue the federal government over a lack of willingness to stop the city’s soot problem. The protest began from the Isaac Boro Park and the procession moved to the Government house, then the Department of Petroleum Resources and finally the State House of Assembly.. But the situation is getting worse. Hospitals in the city are reaching full capacity with the bulk of complaints and admissions centered around respiratory diseases. “I have had to switch my patients with asthma to seretide inhalers. But the volume of cases with asthma and respiratory distress keeps going up,” said a doctor in Port Harcourt, who did not wish to be named. The Nigerian Medical Association state chairman Dr. Datonye Alasia confirmed public fear. “Black soot contains lead, a chemical substance which if inhaled could lead to heavy metal poisoning and other chronic respiratory diseases,” he said in a press conference. 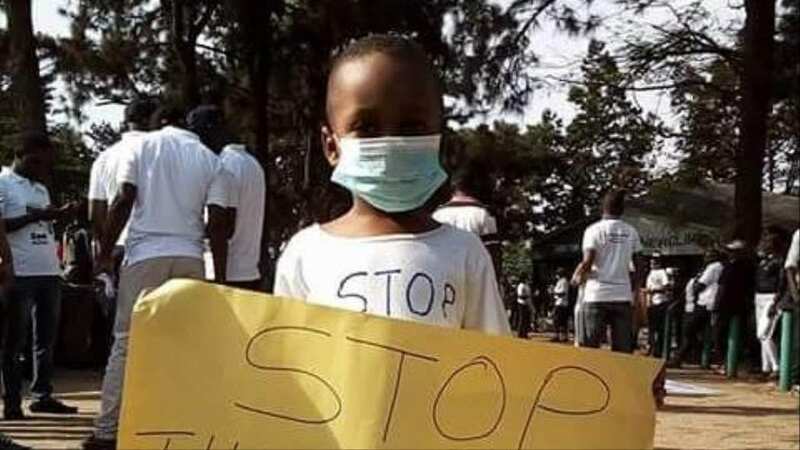 He encouraged Port Harcourt residents to protect themselves and children most especially by shutting windows and using face masks to limit contact with soot. Ezekwesili organised the two protests in Port Harcourt and started the #stopthesoothashtag on Twitter. She has used her radio show to bring the attention of listeners to the problems in her city and how they can protect themselves. And her efforts seem to be paying off: Officials from the World Health Organization and United Nations Environment Program are in Port Harcourt on a fact finding mission. Officials from both organisations visited government organisations and places affected by the soot. "It’s a great start, but we’ll keep the online campaign up and the team will organize more protests until the government is able to shut down the illegal refineries and repair the government-owned refineries so its emissions become soot free," she said. "Knowing the government, this is hardly realistic, but we are here to keep trying."